Economists are a funny species. You speak to two and get three opinions. But in today’s context, this may be a very fair statement about them. That is because when you speak to two of them, you are likely to get more than 100 opinions. This is not a new problem with economists. Kautilya, the fourth century BCE guru on economics, gave a fine piece of advice to his king in the Arthashastra on how to tackle economists. He said consult them because it is better than making decisions alone. But do not consult many because you are likely to get many contradictory and inconsistent opinions. Hence, like a profit maximising producer who minimises the costs, minimise the number of economists to be consulted. But the practical problem is to decide on this ideal minimum number to be consulted. When one looks at the reaction of many economists based on Sri Lanka as well as abroad to engaging the Harvard University-based Ricardo Hausmann as an economic advisor, it appears that the present Government is also faced with this practical problem. When organising its maiden Sri Lanka Economic Forum in 2016, the Government had heavily relied on Harvard University’s Center for International Development or CID for advising it on how Sri Lanka’s future economic policy should be framed. The mandate given to Hausmann was clear: diagnose the ailments from which Sri Lanka’s economy is suffering today and provide a set of sustainable policy prescriptions based on the country’s capacity as well as the emerging global developments. He was accompanied to the forum by another distinguished economist, Joseph Stiglitz of the Columbia University, who had been an ardent advocate of government-sponsored stimulus policies for taking slow-growing world economies out of recession. Stiglitz is a unique case, having been the recipient of the prestigious Nobel Prize twice, once for his work in the field of economics and again for his efforts with respect to the environment. There is clearly an American bias in seeking policy advice here. But it is understandable since the Government had been helped in bringing these eminent economists to the country by another US organisation called the Open Society Foundations, initiated by its founder George Soros, master strategist and billionaire philanthropist. Thus, the three bigwigs at the Sri Lanka Economic Forum were Ricardo Hausmann, Joseph Stiglitz and George Soros, all US-based thinkers. This is not the first time Sri Lanka has sought advice from foreigners to make decisions about its economic destiny. In the late 1950s, the Bandaranaike government invited a dozen key economists of the day to do the same job which the Soros-Stiglitz-Hausmann trio is required to do today. 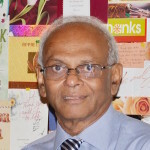 The papers which these economists submitted to the Bandaranaike government were published under the title ‘Papers by Visiting Economists’ by the National Planning Secretariat headed by another distinguished economist, Gamani Corea. Without being used for policymaking, these papers finally got landed in the shelves of a few key libraries in the country helping students and researchers of later generations to write the economic history of Sri Lanka. Then, in 1966, J.R. Jayewardene, Vice Prime Minister and Minister of State at that time, invited the Indian economist B.R. Shenoy to examine Sri Lanka’s case and come up with a program of economic reform. Though Shenoy’s reform program was much ahead of the time, opening Sri Lanka to the rest of the world like South Korea and Singapore at that time, it was flatly rejected by the Cabinet headed by Prime Minister Dudley Senanayake. The report was gathering dust at the J.R. Jayewardene Centre in Colombo until this writer brought it back into limelight in 2015 in a previous article in this series. Hence, Sri Lanka has a good track record of consulting foreigners and then ignoring their advice when it comes to practical application. The Sri Lanka Economic Forum 2016 had utilised local expertise to a minimum. The main professional body of economists in the country, the Sri Lanka Economic Association or SLEA, did not participate in the event either collectively as a body or individually as key members. Economists of the Central Bank or those at local universities were a scarce species at the forum. There had not been a representation by Sri Lanka-born economists now working in foreign universities or in international organisations. Hence, it was an event monopolised by some foreign economists and a select few of their local counterparts. This exclusivity of the representation at the Economic Forum has led to much criticism of the event by Sri Lankan economists and foreign-based economists of Sri Lankan origin. George Soros or Joseph Stiglitz did not play a key role in diagnostic and prescriptive work relating to Sri Lanka’s economic ailments at the forum. That function had been relegated to Ricardo Hausmann and his Harvard CID team. In this regard, Hausmann made a presentation on where Sri Lanka stands at present and where it has to go in the future. An analysis of his presentation was made by this writer in a previous article in the series under the title ‘Ricardo Hausmann’s Message: Restructure exports for growth choosing products over which you can compete with others’. The crux of Hausmann’s argument is as follows: Sri Lanka’s product mix, as demonstrated by its structure of exports, has not changed since 1995. About 98% of its exports have been simple products like garments, plantation crops and a few agricultural products. But the countries which had the same product mix as Sri Lanka in 1995, such as Turkey, Thailand and Costa Rica, have converted their product mix significantly to complex industrial products. This is revealed by the famous Economic Complexity Atlas which Harvard University has produced along with the Massachusetts Institute of Technology. Hence, Sri Lanka’s future will depend on moving away from an import-substitution strategy to an export orientation strategy. Even in that strategy, emphasis should be placed on increasing the share of complex products in exports as had been done by Turkey and other countries. This is where Sri Lanka’s salvation lies. This writer pointed out that the strategy proposed by Hausmann tallies perfectly with the diagnosis of Sri Lanka’s economic ills as presented in Prime Minister’s Economic Policy Statement. Now, several objections have been made to Hausmann, some by ordinary citizens, some by newspaper editors and some by professional economists. Though not related to his question, he had even given a valuable suggestion as to how Sri Lanka’s ailing tea industry could be rescued by inter-cropping uneconomical tea plantations with a perennial tree called ‘Pentadesma butyracea’ which gives an immensely valuable exportable product in numerous ways. This is untapped local knowledge that would come in handy when designing the future economic planning of the country. But it is exactly what Hausmann had suggested at a macro level: move from simple to complex. If in the new policy paradigm, as this writer too had pointed out earlier, the government redirects the country’s research outfits at universities, Industrial Technology Institute, Tea Research Institute, Rubber Research Institute and Coconut Research Institute to come up with new inventions, it would satisfy one condition needed for the country to move from simple technology based products to complex technology based products. The other condition is to innovate the inventions through entrepreneurship supplied by the private sector. This is the policy challenge faced by Sri Lanka today and readers feel that Sri Lanka does not need a Ricardo Hausmann to make suggestions. There is ample local knowledge available, according to them, in that respect in a scattered and hidden form. It is a matter for policy makers to tap them. Thus, the answer to the question raised by the reader what is wrong with import substitution if that import substitution leads Sri Lanka to capture the global market via new inventions supported by innovation is very clear: there is nothing wrong in that. What is wrong with is the use of import substitution to feed only the local market as done in Sri Lankan policies either directly as import substitution or later in a different terminology, import replacement industries. This reader should be commended for ‘looking beyond the frame’ in making new suggestions. Two renowned economists too had confronted Hausmann directly. One was Sirimevan Colombage, central banker turned academic with wide experience in both theoretical and practical economic policymaking. The other was Prima-Chandra Athukorala, the world renowned Sri Lankan economist presently attached to the Australian National University. In two recent contributions to the Sunday Times, they had disputed Hausmann. Debating economic policy strategies and directions in this manner is a good sign and it is in line with good economic policy governance to which the present Government is also committed. Both these economists are not for import substitution. They value very much the need for adopting export-oriented economic policies. Research done by both of them on the Sri Lankan economy has revealed that there had been marked difference in economic growth of the country during the two policy regimes, import substitution policy regime and export orientation policy regime. Hence, at a macro policy level, there is no difference between them and Hausmann. The difference arises due to the micro application of the Hausmann proposition. According to Colombage, there is nothing new in what Hausmann has suggested at the Economic Forum. This is true. If one looks at the proceedings of the annual sessions of the Sri Lanka Economic Association in the last ten-year period or so, this message was delivered by SLEA in much vocal form with top policymakers at the head table. Most of the proceedings have been published by SLEA in book form for later reference by interested policymakers. The proceedings had been addressed by a diversity of economists assembled by SLEA for the purpose. Hence, as Colombage has argued there is no value addition by Hausmann to the knowledge base of the policymakers of the country. What it implies is that Sri Lanka could have done a better job by assembling local talents and expertise available within and outside the country. Athukorala has disputed Hausmann from a different point. He has questioned the validity of Hausmann’s Product Complexity Atlas for practical economic policymaking. This Atlas is the product of the joint effort of two distinguished institutions of higher learning, namely, Harvard University and the Massachusetts Institute of Technology, both ranked within the top five universities in the world. By using the access to big data and the enormous data processing capacity of these two universities, Hausmann with Cesar Hidalgo of MIT, has mapped the world according to the complexity of the exports done by individual countries. It has helped the policymakers to identify where each country stands today globally, and in which direction each country moves with the passage of time. It has also helped policymakers to identify winners and losers and leaders and laggards just by looking at the nature of the product mix which each country has. However, according to Athukorala, Economic Complexity Atlas has ignored one basic recent development in production by different countries in the world. That is the complexity and wide usage of the global supply chain in global production today. In today’s context, a product that is exported from a country does not belong to that country altogether. Export is recorded at the assembly point but the particular product has used many inputs that have been produced in a large number of countries. For instance, iPhones and iPads are exported from China and recorded as Chinese exports in global data because they are finally assembled in China. But, inputs of these two products come from a number of countries in the region, namely, South Korea, Japan, Taiwan, Singapore, Malaysia, Thailand and Indonesia. Though the Complexity Atlas gives credit to China for the export of iPhones and iPads, their value addition in China is only a fraction. Athukorala’s proposition does not reject Hausmann totally for policymaking. What it suggests is that when translating Hausmann for practical policymaking, a country should be conscious of its ability to get integrated into the global supply chain. A country cannot produce a product completely on its land today. It has to depend on a number of other countries that supply inputs to that product. This production system is organised as a global supply chain and what Sri Lanka should do is to prepare itself to join this supply chain seamlessly. The Government cannot design and implement its economic policy relying completely on Harvard CID and Soros’ Open Society Foundations. It has to tap local expertise and talent. Hausmann is already in the hot seat being challenged by local economists. Thus, the Government which has invited him as an economic advisor is also in the hot seat. Because economics is not science. it is Pseudo-science. If you try yo go to the moon with economics predictions, you will get lost in Jupiter and beyond, or head towards the Sun. Get the opinions of the minimum number of economists, do a coin toss and pick one. You will get about the same outcome. Capitalism has reached it’s point where we as a species where we have overproduced and are capable of producing abundance and only a planned economy can make the change for the right things to be produced and to be allocated in terms of need instead of goods being produced to make more money, very wasteful system of production, capitalism is dying and working class people wish to do more in their lives than work futile meaningless quantitatively produced jobs by rank and file corporation industry and retail which has been the main reason behind why the human race’s scientific and technological process is slowing down in terms of even the most technological items that are in our society have the deliberate flaws in their production so they can be bought again when they break, simply for more profit. That include the confused economists. Given the poor quality of the talks by those local university dons who did represent Sri Lanka at the forum, I am glad they did not bring on board more! You say “Economists are a funny species”. You can also add ex-Central Bank officials too! A notorious bond-thief governing the CB, what more can we expect? Down with you and this boot-licking mob. Excellent article. You should have been the Central Bank Governor, instead of that imported man. I saw an article or column written by Nalin De Silva about the present status of economy and its problems, that can not be solved by the RW/MY3 government. This article was appeared in the “Rivira” news paper. Nalin De Silva says that the most important problem faced by the government or private sector is to find the “Long Term Capital” required by the Economy. 2. Why they should invest in Sri Lanka on technological products. If you could answer those questions, you can provide a better answer or policy guide to Sri Lankan government than the Harvard Economists. America market is growing compared to other countrified. Make an effort to regain markets. Good one Dr. Wije. Keep it coming! Ranil loves running after the West and they have embraced him because of, guess what, CHINA! LOCAL KNOWLEDGE is also GLOBAL KNOWLEDGE. Many of Sri Lanka’s top economists are also trained in top western Universities but are being ignored. Sri Lanka economists know that it is NOT a lack on knowledge and expertise in the country, but Corruption, criminality and rotten Governance by POLITICIANS and their Stoogers (Arjuna Mahendran the Insider trader and financial criminal at the CB is a good example) are the main reason for BAD economic policy making in Lanka. Did the Harvard economists come up with a concrete solution to the looming Balance of Payment Crisis in SL? No, the same tired solution are being touted – borrow from the Global Financial Criminal Legalization outfits that promote massive INEQUALITY – IMF and WB which turn a blind eye to CORRUPTION. This is what they did in Greece and so many other countries! Its wheels within wheels! All a big game called TRICKLE UP a la Davos! Amid all the games that are played between the World Bank, IMF and the Global Banks that are criminal looters of the global public wealth, economic inequality is massive 63 individuals own half the world’s wealth – wonder what definition of wealth we are using?! – and indeed Trickle Up is the name of the IMF’s criminal game. All these so-called global institutions and the criminal banking sector they support should be taken to court, held accountable and SHUT DOWN! The very first requirement is to plug waste of national wealth. Not a word about this. What kind of economics is this? The Global economist have begun to created alternative indices for monitoring of economic prosperity and well being of People based on quality-of-life indictors, well rather than mere Gross Economic Output or GDP. These are few of many quality of life Economic Index Models. And other such infant mortality, longevity of life, the availability of health coverage, the level of educational attainment, average of weekly earning, major eradication of poverty level ,income inequality ,affordable of housing ,the cleanness of environment, biodiversity, the remarkable decrease in crime, the amount of leisure time and so on. These are task of to be judge by and large the overall performance of Ours National Economic Development of current task undertake by UNP led regime. This is New Era of Sustsnibility of political -Economic democracy, nation oriented moves beyond arbitrary political class of UNP, TNA ,JVP and other and their boundaries to rediscovering democratic Revolution. The ruling bourgeoisie class in power UNP-Ranil W.. MS-President and CBK has learn the quality of life ,however speaks to new vision of the future democratic revolution that based on collaborative interest, connectivity and interdependence of ongoing Globalization which Sri Lankan is partnership member of world community. But both UNP-Ranil and MS & CBK national government represent the completely bankruptcy of new Government installed since 2015 January 9th both with the dexterity of experienced politicians ,skilfully mask this economic and political bankruptcy and their own bankruptcy and desertion to bourgeoisie revolution with “good governance and rule of law” catchwords. The Current Government give us striking examples of what is typical UNP_-Ranil W.. of economic democratic opportunism, ponderous, that theorizing and grossly falsifying of ‘Rule of Law and Good Governances’ by trimming of all values of democracy ,that is unacceptable to democratic and progressive forces that the side of path of economic development. Both UNP-Ranil and MS +CBK radically distort democracy values and development of national economy on the current state as well as practices of wrong economic path and its democracy. Needless to say Both parties of democratic and revolutionary development in words, but they traitors of in practice of democracy political-economy. We have to strain every effort to UNP policies of economics to dissociated themselves from the development . Both in economic sense UNP-Ranil nor MS+CBK does anything of sort precisely because they themselves are traitors to democratic and economic development. Who they want to maintain their reputation as Democracies and bourgeois class among new bourgeoisie’s. The leadership of UNP political trick is also equivalent to subservience to US and Indian big bourgeoisie economic interest. The UNP is willing to talk about economic development ,what will happen, when it is necessary to govern men and women of Island of Sri lanka. UNP-Ranil… MS and CBK fail to notice that their democracy suppressed development and suppressed masses of majority. The history of recent time since 2009 May of the War against LTTE Terrorism and post-war period has remarkable economic development with extraordinary speed and its goes show Sri Lankan achievement. And that all in all Sri lanakn we must draw a lesson from past terrible experiences of our WAR footing economy and Tamil Terrorist history after Independent 1948. The new economic development policy played by UNP into the hands of US ,UK and Indian powers not that national path and model of sustainability of Capitalism -Sri lanka.